Head to Mexico with Guts Casino to play the exclusive Piñata Fiesta slot from iSoftBet – it comes with a free spins feature with 4 exciting piñata modifiers. Piñata Fiesta guarantees an overload of the senses – it’s high energy, colourful and comes with an upbeat soundtrack. Visually superb, you will see margaritas, guitars, cactus characters and flaming jalapeños on the reels. The golden star balloon is the wild which performs the usual substituting duties. The most important symbol is the piñata – 3, 4 or 5 will activate the Free Spins feature with 10, 15 or 20 free spins. Look out for the piñata appearing as it will reward you with additional free spins. There’s are also 4 randomly triggered piñata features which add to your winning potential. Floating balloons can appear to trigger the Popping Wilds feature to reveal more wilds to the reels. The Mega Spiñata feature gives you 1 colossal reel which occupies the first 3 reels entirely. The Fiesta Frenzy feature sees 1 of the royal symbols become a high value or wild symbol whilst the Grande Reels feature adds wild reels. With even more free spins to be won randomly at the end, Piñata Fiesta is sure to get you in the mood for the street party – with wins of up to 250 times your stake on every spin/free spin, make sure you visit the Piñata Fiesta slot review for more details. 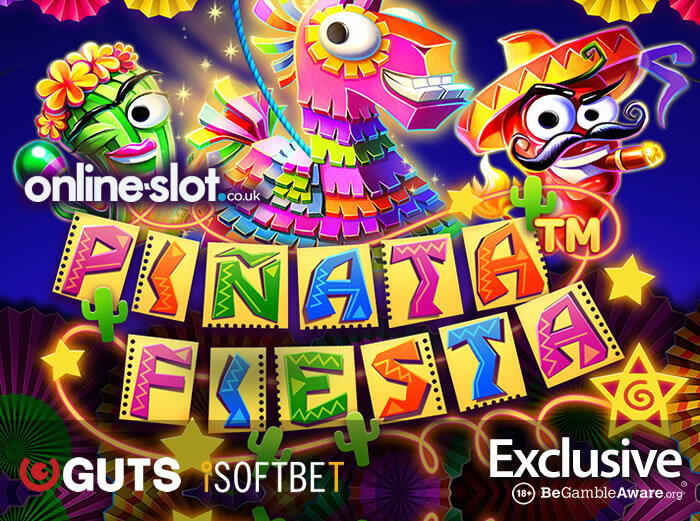 Piñata Fiesta will be released by iSoftBet on the 18th of April (2019) but is exclusively available early at Guts Casino – with 100s of slots, they are known for their excellent customer support, ongoing promotions and fast cashouts. New UK players are welcomed with a 100% match bonus up to £100 as well as 50 free spins, with no wagering requirements, on NetEnt’s Vikings.